Elros - The Edain (humans) like the Elves, also had to find a new home. But instead of staying on Middle Earth, they sailed to the island of Númenor in the Sundering Sea. 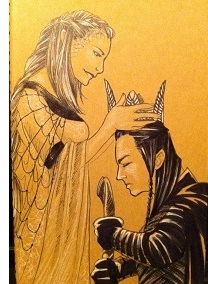 Elros, the son of Eärendil and Elwing, and twin brother of Elrond, became their first king. He took the name Minyatur and became Tar-Minyatur of Númenor.